Well I posted a few pics of my 10G tank a while ago but those pictures were taken befoer I had added my two Otos. 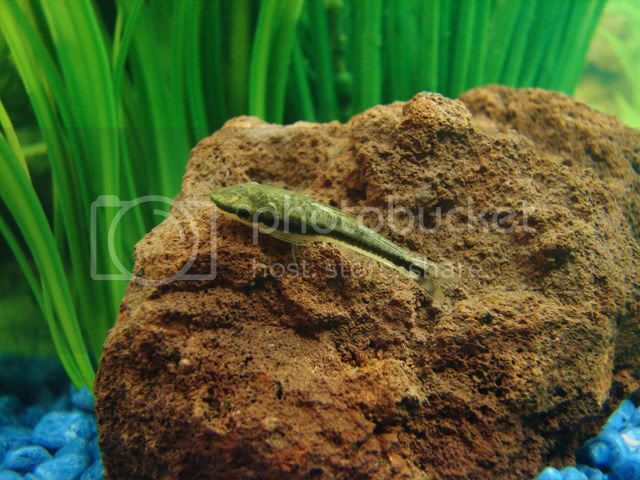 Now that they are in and seem to be settled I thought I would post a pic of one of them sat on a piece of rock in the tank. I think he looks happy don't you? Awwww is he ever cute! He sure does look happy. Is it just the lighting or is he really green like that? He does have a greeny/brown colour to his back. I have lightened the picture slightly to make everything stand out a bit better but it is not far off his natural colour.